Your vacation of a lifetime is awaiting you at 'THE TERRACE- PELICAN BEACH' on Emerald Coast Highway. This centrally located Fourth Floor, 1400 Square Foot condo overlooks the fabulous heated pool, 2 lakes and has view of the gulf. Enjoy absolute luxury in one of Destin's newest Gulf-Front Resorts, with a 24 hour security. Enjoy 2 private beach club pools (Gulf-front and lake view), and the Tiki bar at the gulf, the Pelican-Beach Kids club in the summer season, and a 500 ft. walk to the Big Kahuna Water Park. Free High Speed Wireless Internet, Washer and Dryer. Large rooms... Eight foot ceilings... Ceiling fans throughout... Professional management...Truly first-class!!! 3 BD/3 BA condo comfortably accommodates eight people. It features a Private Master Suite with King Size bed, a whirlpool Jacuzzi, and a dressing area. The second suite has a Queen Size bed, its own balcony with private bath and an extra kitchenette. The third bedroom has two twin size beds. The living room has a Queen Size sleeper sofa. 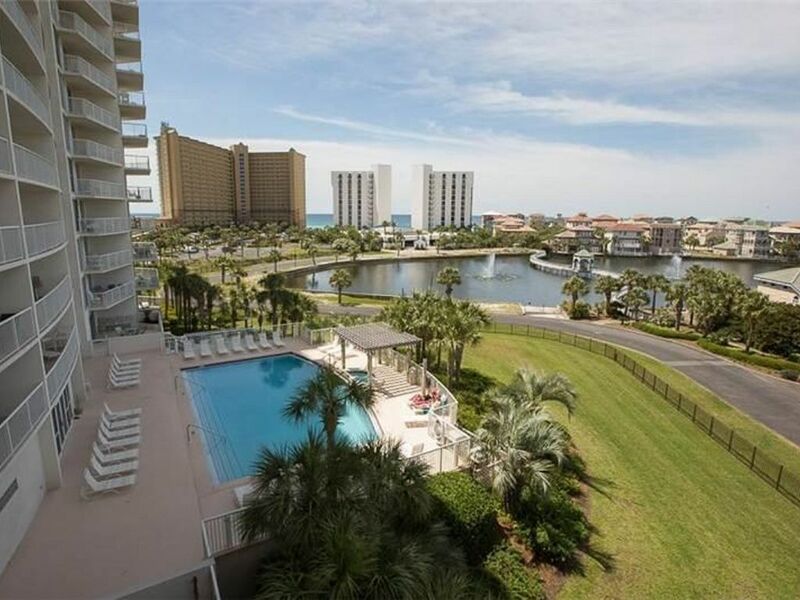 Enjoy your favorite beverage from the incredible 300 square foot balcony with floor to ceiling patio doors... where you can view the spectacular sunsets on the Gulf, the awesome heated pool and hot tub, the gorgeous city of Destin. The popular 'Restaurant Row' nearby, and everything you could possibly desire is within walking distance!! No smoking and No pets allowed in the unit! Very nice condo with plenty of room for the six of us. Great view in a convenient location. Overall an amazing vacation! Beautiful view, walking distance from beach, with a walkway directly to beach! Great room! Very clean and taken care of. The owner was excellent at communicating with us if we had any questions or concerns. Very nice and such a beautiful view. The condo was very nice and clean. It was spacious and we will definitely be going back. Our stay got cut short due to a hurricane. The owner was very nice and gave us a refund for the days we didnt stay..
We enjoyed the fabulous view of the city, the landscape and the partial view of the Gulf of Mexico. The beach is only a short walk away, it was not crowded and had plenty of room for our umbrella and chairs and sand toys. We have been to many beaches in the US and abroad, the Destin beach is the best by far. We spent a few evening hours there, were able to identify many stars and planets, it was just an out of this world experience. On the practical side, the building and Pelican beach resort have so many amenities (several pools, hot tubs, steam room, sauna, fitness rooms, tennis courts, ample parking, reasonable security measures, etc.). It is within walking distance from Target, Water Park, many restaurants and coffees shops. Boat rides, the harbor, boardwalk, department stores and wide variety of restaurants are very close. There is plenty to do in Destin and the surrounding area. The condo owner Tom was very accommodating and prompt in answering our questions, he was in town when we were there and stopped by to check on things and brought us additional beach chairs. Our family had a very pleasant vacation, I will not hesitate to do business with Tom or rent that unit next year.